Sandra has been busy making some cards to enter into challenges. One such challenge that she found was with the Penny Black stamp company. Supplies: Penny Black Be Very Scared stamp set,Graphic 45 patterned paper, Dew Drops, Tim Holtz Black Soot Distress Ink, Memento Tuxedo Black Ink, Copic markers and Neenah and Bazzill card stock. Posted on October 15, 2015, in Card Samples, Felix (Sandra's) Card Samples, Sandra's Challenge Entries and tagged challenges, Copics, Penny Black. Bookmark the permalink. 2 Comments. 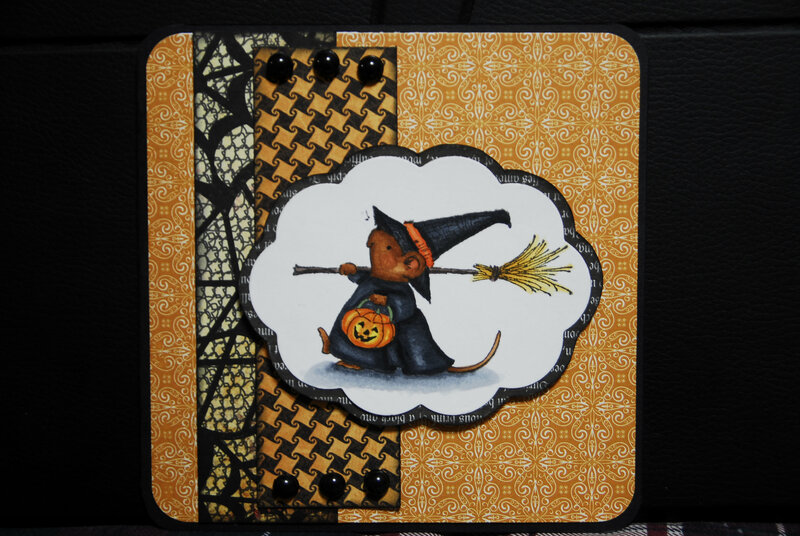 A really super Halloween creation Sandra and the spiders web border is very effective, many thanks for joining in at Penny Black and More challenge this month. This is one of my fav PB images, I like the background you made to complement it.